MA Guide Levi Lambert End of Summer South Platte Report. Flows have been stair stepping down and currently are in the mid 300’s, fishing has been good, apart from a few slow days here and there. Lots of bugs to choose from this time of year, and the fish are everywhere you would expect them to be (pools, riffles, banks, tucked into structure, etc). Trico’s hatch’s in the late morning will have fish rolling in the soft water and seams. The funnest approach for these fish is to target them with a tandem dryfly rig. The first fly is usually a (hairwing caddis, high vis adams fly, stimulator in sizes 10-16) with about a 12-16 inch tailer to a sz 20-22 (trico spinner, sparkle dun, parachute adams). Or you could just go after them with a dry dropper rig, I’d use the same first fly selection as stated above but my trailer fly would be something with a bead head such as a rainbow warrior, zebra midge, black beauty etc… in size 20-22. The mini rig is still a very effective tool this time of year with these flows. (see my previous fishing report for mini rig setup) If you’re not getting hook ups on the subsurface fly’s I would recommend adding a little more weight between them, this should make the takes more noticeable. Nymphing is still a very productive method for targeting the sand fish and those trout that are still sucked down in the water column. Lead fly’s this time of year consist of san juan worms, pat’s rubber leg, 20″ers, and crane fly larvae (especially if you see the water going off color). The middle fly is most often a soft hackle caddis imitation sz 14-16. Point fly’s include red/black midge larvae in early am, and baetis imitations is the mid morning to evening, (think rainbow warriors, flash back PT’s, chocolate thunders, Barr’s emerger, juju baetis) in sizes 18-22. 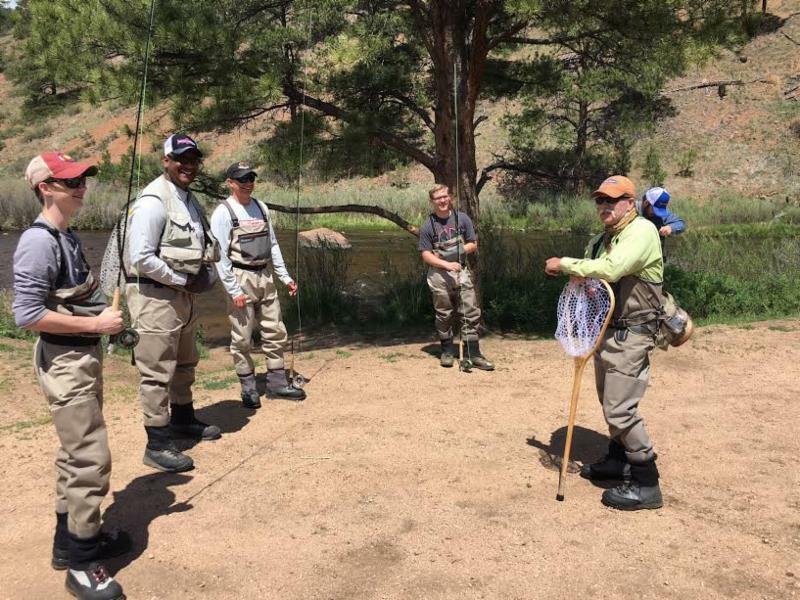 Back for 2017, Minturn Anglers has revamped our fishing school on the front range and we are proud to offer our new Introduction to Fly Fishing class. This class is a great way to introduce new anglers to the sport of fly-fishing as well as help refine the skill sets of experienced anglers. Our new classes are a one day program offered on both Saturdays and Sunday’s and feature a 1-hour on river interactive class followed by a 4-hours of semi-guided fishing instruction. The class will cover everything from gear, knot-tying, basic nymph rig instructions, river mechanics and much more! Anglers who complete the course will be armed with the tools necessary for a successful day on the river the next time they venture out. Minturn Anglers is excited to announce it has expanded upon our line of Co-Branded Patagonia apparel. Swing by the shop give us a call snag a shirt or hat! Low clear water but it’s cold and the fish are loving it. Believe it or not, we are still seeing Yellow Sallies on the lower river and plenty of caddis and tricos to compliment as well. We have been getting asked regularly about Spinner falls? you can bet on it! However, don’t bother with the dries if you don’t see them actively eating on top but please fish the nymph during the top water slow times. Smaller patterns are catching fish like pheasant tails in a 20-24, medallion midges (20-24), Starling Softies (17-19), or any small bug you fish confidently with good deep drifts. Swinging soft hackles can be very productive through the riffles during the heat of the day when the fish stack up in the oxygenated water. With the cooler temps, the fall fast approaching and we’ve seen encountered some big hungry browns this Summer and expect more for the autumn months so book your Fall brown trout trip today!